Whether it's a special occasion or just a Sunday roast, knowing how to cook a roast chicken is practically a life skill. 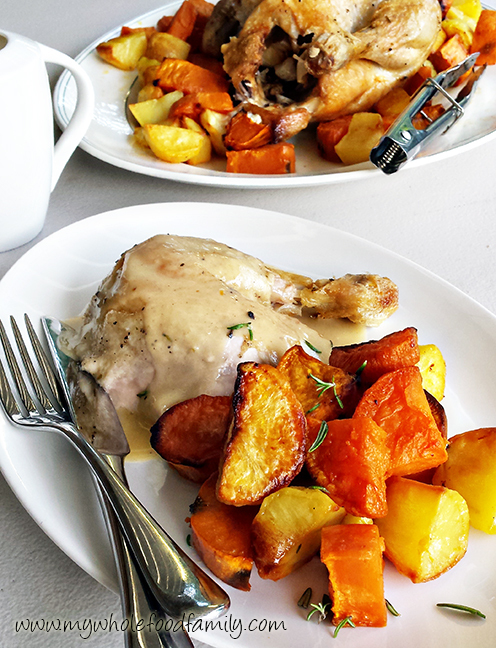 What other food is as comforting and economical as the humble roast chook? Growing up we regularly had roast chicken but apart from the drumstick it was never my favourite thing. The breast meat was always quite dry and powdery and without smothering it in gravy it didn't really have much flavour. But after learning a few simple tips and tricks I can finally say I have mastered the roast chicken and we have one every fortnight. 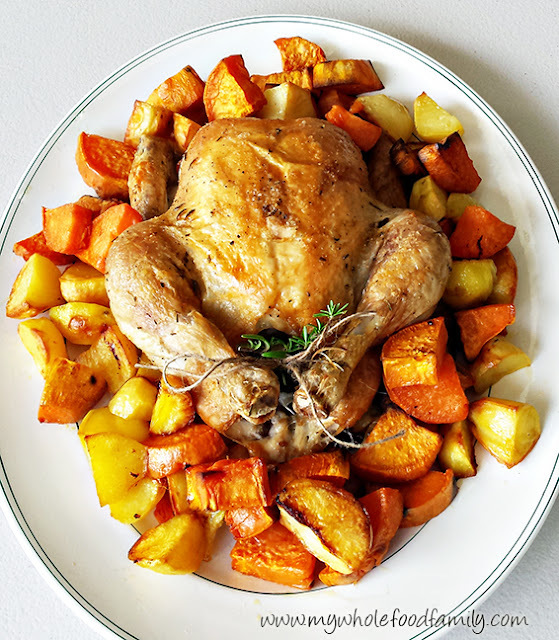 Forget buying a ready roasted chicken that is packed with nasty ingredients from the supermarket, my perfect roast chicken will become a staple at your place. First things first, you need to choose the right chicken. If your budget allows then organic and free range is definitely the best and if you choose a large one it should give you enough meat for 2 dinners and a litre or so of broth from the bones. To make sure you have enough meat for 2 dinners don't serve the chicken whole at the table. Instead carefully strip the meat off the bones and reserve some immediately. I allow just over half with roast vegetables for the first night then freeze the rest for risotto, stir-fry or just a salad loaded up with green veg, avocado and a great dressing. Don't forget to save all the bones for a broth - you can pop them straight into the slow cooker if you have one with some veggies and a few litres of water (I will be posting the full recipe for my bone broth soon so keep an eye out for that). 1. Check your timing - a good rule of thumb is to cook your chook at 190 degrees Celsius for 25 minutes per 500g plus an extra 20 minutes. 2. Flavour the chicken from the inside - lemon, onion, garlic and herbs are all brilliant. 3. Turn it upside down to rest - this will guarantee juicy breast meat. 4. Rest the meat for at least 20 minutes or anywhere up to half the cooking time, just cover with a few sheets of alfoil and a folded towel to keep in the heat. 5. Use the pan juices to make amazing gravy - you will see in the recipe below what I do to make an easy chicken gravy. Preheat the oven to 190 degrees celsius. Place the duck fat into a large baking dish and put in the oven to heat up. Place the chicken into another large baking dish (I use pyrex). Place the garlic and half the onion inside the cavity. Pour the oil over the top of the chicken, sprinkle on the salt, pepper and rosemary and massage them all in well. Add the onion to the dish and pour in the water around the chicken (this will form the basis of the gravy later). Carefully remove the hot baking dish from the oven and tip in the chopped vegetables. Use 2 spoons to toss the veggies in the duck fat, sprinkle with salt and pepper. Place both baking dishes in the oven and roast for 1 hour 40 minutes. Remove the dishes from the oven. Place the chicken onto a serving plate and using tongs, carefully turn the chicken upside down (breast side down). Cover with foil and leave to rest for at least 20 minutes. Pour the pan juices and the onion into the Thermomix bowl along with 25g butter, 25g white spelt flour and 1 ts vegetable or chicken stock paste. Cook for 5 minutes / 90 degrees / SP 3. The puree for 10 secs / SP 9. Check for seasoning. 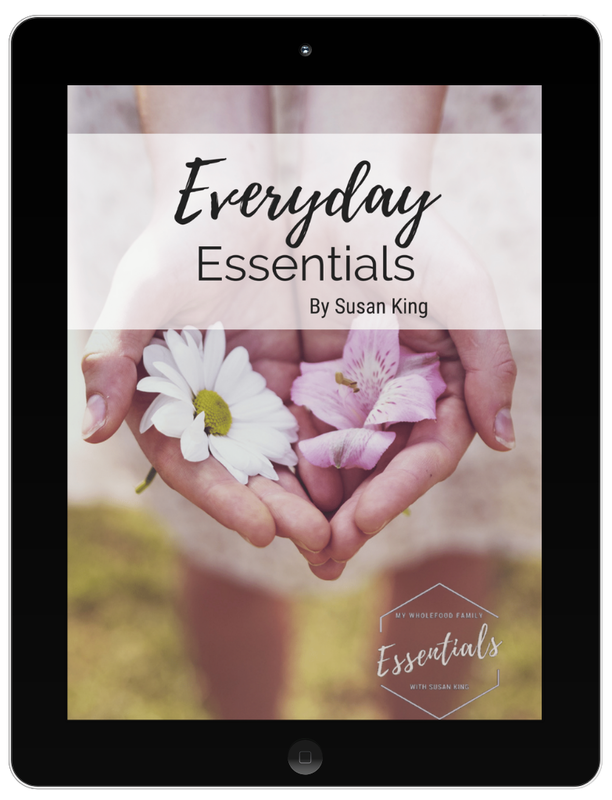 Linking up with Domesblissity's Thriving on Thursdays. Hi Susan. I was raised on roast chicken dinners. It was quite an affordable and tasty meal back when I was young. I tend to buy rotisserie chickens from the supermarket because they don't quite taste the same as my Mum made them. I'd love to try your recipe. It looks delicious. Thanks so much for sharing at Thriving on Thursdays. I'm featuring this post at tomorrow's party. Hope to see you again.